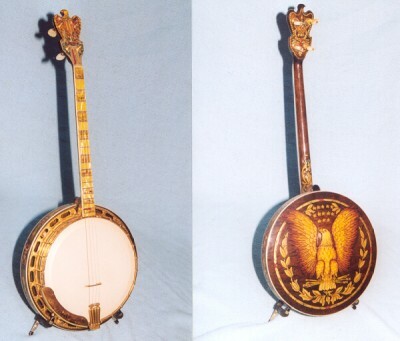 The only tenor banjo in the Michael Shames collection. Reason: no All American plectrum was ever produced. About 12 to 15 of these were made, and all were tenors. Only about half survive today. This was the last of the Gibson line of carved Mastertone's. 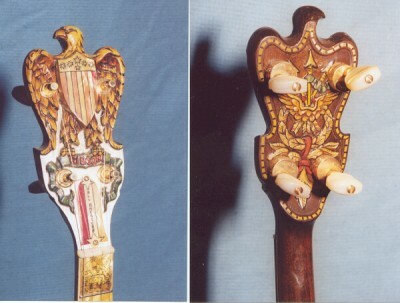 The S/N of 9747-3 indicates a date of around 1935, shortly before all elaborately carved Gibson's ceased production. This banjo was acquired from the original owner, who never played it, but used it only for display. To this day it is brand new, and the finest known example. 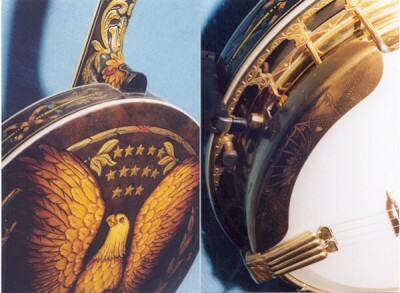 An interesting sidelight about this instrument: When the new Gibson Co. re-introduced it's fabled Florentine and All American models back in the late 1960's and early 1970's, there was nobody who could remember what the All American looked like, and the original documents had been destroyed. 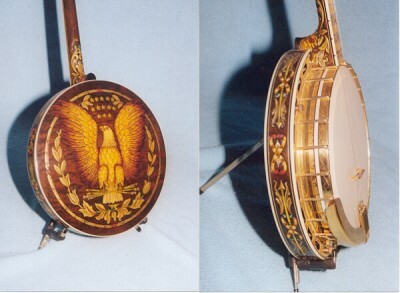 Therefore this banjo was sent to the factory, to be used as the model for the reissue.